Is this the greenest football club in the world? Newly promoted to the Football League for the first time in the club’s history, the Green Devils, as they’re known, at Forest Green Rovers have plenty to smile about. In 2010, the club teamed up with Ecotricity, the green energy company, in what is something of a passion project for Ecotricity’s founder Dale Vince. It has since been named by world governing body FIFA as “football’s greenest club”. Together, they are changing perceptions of what football should and could look like: from pitch to (vegan) plate. The club introduced a fully vegan menu in October 2015 and, in May this year, officially become the world’s first vegan football club, after its plant-based menu was awarded the Vegan Trademark. 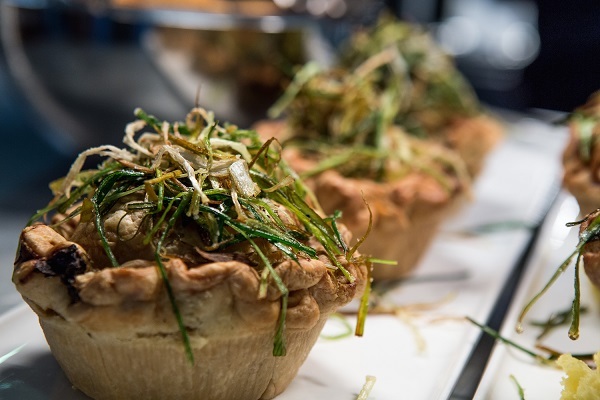 Its Q pie – a Quorn and leek pie made with soya milk bechamel – won a podium spot at the 2017 British Pie awards. On 1 April, the club unveiled its new broccoli and carrot print football kits for the upcoming 2017/18 season, alongside announcing a new shirt sponsorship deal with Riverford Organic Farmers. 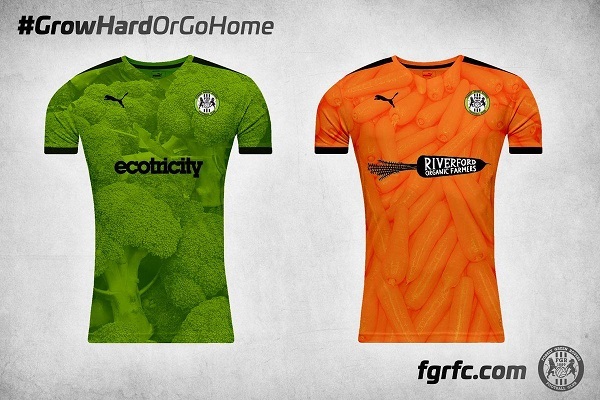 The new kits reflect Forest Green Rovers’ plant-based ethos – with a green broccoli print for the home shirt and an orange carrot design for the away shirt. “At Riverford, our motto is ‘live life on the veg’, and it’s great to see a whole team dedicated to playing football on the veg!” says a spokesperson from Riverford Organic Farmers. The kits will be made from a combination of sustainable materials, including hemp, pineapple fibre, bamboo and floral pois. That’s some tasty togs. The club are yet to confirm that they’ll be wearing the shirts for this coming season, or if it was just an April Fool’s joke. 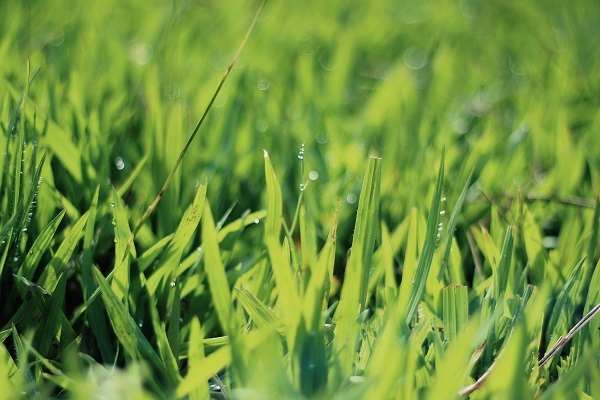 The club has the world’s only organic football pitch, which has ditched conventional pesticides and herbicides in favour of an all-natural approach, including the use of a Scottish seaweed solution which helps keep the grass strong and healthy. 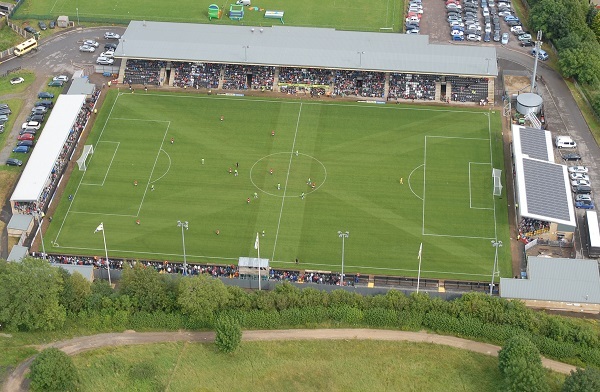 The pitch at The New Lawn has a first class drainage system and the club also collects all rainwater that falls on the stadium roof – which is then recycled to be used on the pitch – meaning that the club is virtually independent from the mains water system. When the UK’s first electric ‘mow-bot’ arrived at the club, it put Rovers in the same league as Bayern Munich, who also care for pitch and planet using this technology. 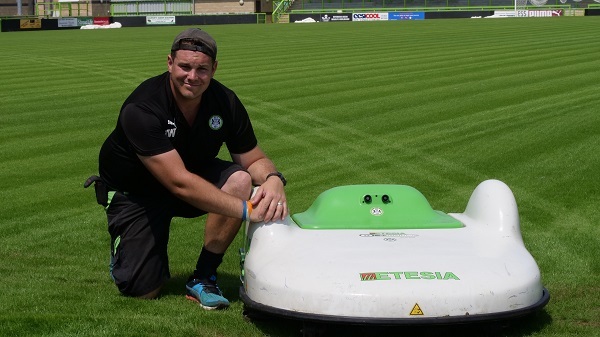 The ‘mow-bot’ uses GPS technology to automatically mow the pitch without the need for human intervention – saving up to 50 per cent of the club’s groundsman’s working week – it even sends him a text if it runs into trouble. Powered from 100 per cent green electricity from solar panels on The New Lawn stadium roof, the eco-friendly R2D2 will trim the club’s carbon footprint as well as the grass, and can be used for other sporting pitches such as rugby and cricket. 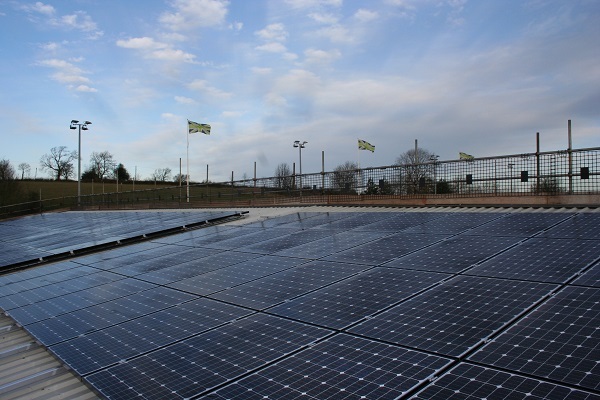 The first thing that fans of visiting League 2 clubs will notice when they visit the New Lawn is a wildflower meadow and a solar panel, before finding three ‘electricity pumps’ which are regularly seen charging the fleet of FGR branded electric cars which are used by staff and players. It’s an unusual welcome to a football club, but then this is no normal club. Ecotricity is a Brands of Inspiration partner of Positive News. We partner exclusively with organisations that are having a positive social or environmental impact, and which care about their media footprint. In exchange for financial support we provide our partners with opportunities to connect with our audience.